US consumers will soon be able to get their hands on the fully redesigned 2016 Hyundai Tucson crossover, and now they know exactly how much they will have to pay for the vehicle they want. There will be 4 different trim levels made available, with each one having something that will appeal to specific customers. The base model is the SE, which is a front-wheel drive that starts at just $22,700. Standard features on the 2016 Tucson SE include multi-function steering wheel, AC, rear-view camera, 6-speaker audio system, Bluetooth/iPod/USB/AUX connectivity, tinted windows, 5-inch entertainment display, 17-inch alloy wheels, and more. If you want to add the optional AWD to your Tucson, the starting price will then come in at $24,100. The SE is equipped with a 2.0-liter 4-cylinder GDI engine that delivers 164-hp and 151-lb.-ft. of torque when mated to a 6-speed automatic transmission. The next trim level up is where the Eco resides. It has a starting price of $24,150 when equipped with FWD. For that price, you get all of the equipment found on the SE, and also adds fog lights, LED daytime running lights, illuminated vanity mirrors, roof rails, power driver’s seat, and more. Under the hood of the Eco is a 1.9-liter turbocharged 4-cylinder that generates 175-hp and 195-lb.-ft. of torque. It’s an efficient engine that is mated to Hyundai’s new 7-speed dual clutch transmission. Adding AWD takes the starting price of the Eco to $25,550. The cost of the Sport trim is higher, but that also means more premium features. The starting price comes in at $26,150, and standard features include 19-inch alloy wheels, power liftgate, and a host of safety features such as rear-cross traffic alert, blind spot detection, and lane change assist. The addition of AWD takes the starting price up to $27,550. The Limited is at the top of the Tucson range, and comes available in both AWD and FWD, as well as being fully loaded with features. Premium is the name of the game with the standard features, which include LED lights in front and back, painted interior trim, power passenger seat, rear air vents, dual-zone climate control, and an electrochromatic rear-view mirror. You also get a killer sound system and an 8-inch infotainment system complete with GPS navigation. 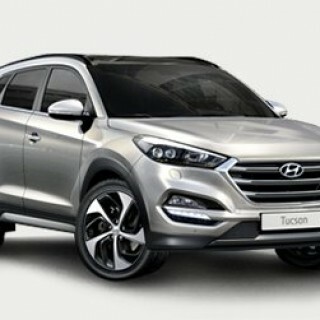 The new Hyundai Tucson Limited with FWD starts at $29,900, while the AWD model starts at $31,300.